Swim Spa Pools: What Makes Them a Good Investment? It’s been long known that the water has therapeutic properties so it’s no surprise people have used it as part of their relaxation routines for millennia, be it in the form of sauna or swimming. Having a pool at home allows you to reap the benefits of swimming daily, yet not all of us have the homes or budget to fit a pool. If you want to swim and don’t have a pool of your own, you can still pull it off without paying trips to the local pools thanks to the ingenious design of swim spa pools. Not only are they available in a wide range in terms of models and sizes, they differ in their designs based on how much depth it is you require depending on your specific swimming and exercising needs. Also, you have the chance to choose from a variety of swim spa pools when it comes to the features you find most useful, such as dual temperature zones for separate swim and spa areas, massage walls with massage jets and recliner, aromatherapy system, easy care water management system and LED lighting among others. You have plenty of options of colours to pick from so whatever your taste and requirements are you can get a customised swim spa pool. Thanks to being a combination of pool and spa they make a better option than traditional pools because you get to benefit the best of both worlds: relaxing and exercising. Besides, they’re easy to fit in your home without needing to undergo a makeover project, so in the end when you sum up, they’re also the more cost-efficient alternative. Additionally, speaking of costs, taking care of a pool, especially the inground one, can be costly as there’s the hiring of a professional cleaner to think of, and if you plan on carrying out the cleaning yourself essential tools and equipment like vacuums, pool poles and leaf traps are a must. 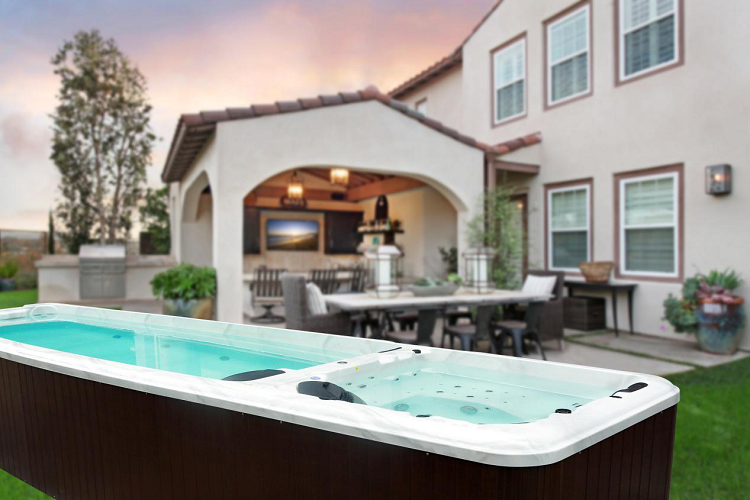 A swim spa pool allows you to spend less time cleaning and more time having fun. All you’d have to do daily is check the water levels, make sure you have enough for a good swim, and test the pH levels weekly, along with topping up the chemical dispenser. As for the filter, it could do well with a soak in specialised cleaning solution once a month. Get yourself a swim spa pool and you can plan on entertaining every day – it’s easy to create a unique event thanks to the light shows and aromas.